It's Twirler Tuesday! Since ESPN's College GameDay series announced that they were headed to Philadelphia for an exciting match-up between the undefeated Temple University Owls and the Fightin' Irish of the Notre Dame, we thought we would tag along! Today we would like to intorduce you to Inga, Maric, a junior at Temple University studying early childhood education with a concentration in special education. CMB: So why did you want to twirl in college? 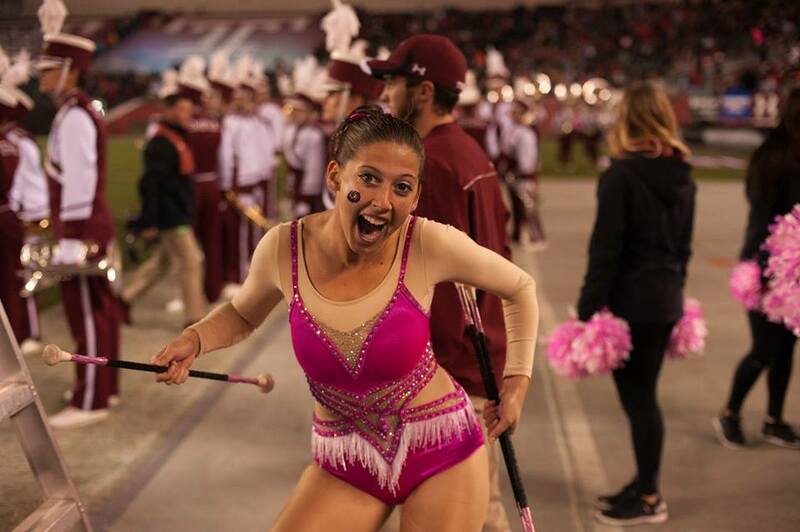 IM: I never really thought of twirling in college, but I heard that the current feature twirler was going to graduate so she mentioned something to my coach, Chris Yerger, who told me about it. I was thinking, "Why not?" and just decided to try out and won the position amongst 7 other girls. I had thought about previously twirling in college when I was younger in my teens, but I ended up quitting competitive twirling competitive twirling in high school and just did talent shows for fun. When I heard of the open position, I hadn't twirled for 10 months, but decided it was time to start up again. It's really interesting because I get to decide where to go on the field and make up my own routines! IM: I started twirling at the age of 7 to get more involved when my family moved from Croatia to America. Ever since then, I fell in love with baton twirling. I have gone to Twirl Mania which is an international twirling competition and won 1st place there in one and two baton. Also, I won various state and regional titles at NBTA, TU, DMA, AAU, Junior Olympics and many more! IM: Before game day, I am usually really hype! The band at Temple is a phenomenal band to be in and the atmosphere makes it seem like a family. In the morning, we typically have rehearsal where I go over my routine and if I forget something I tend to wing it. Then th ebus leaves to go to Lincoln Financial Field where we perform at a tailgate, pregame and halftime. The band and football team are all fighting the same University during the game so the band's relationship with them is a close one. CMB: What Advice do you have for younger twirlers considering twirling in college? IM: If it is your passion, go for it. It does not matter if you are a feature twirler, a twirler among many twirlers or think other twirlers are better than you, just go out there and try for that position. If you get the position, always remember that you were chosen for a reason to twirl at the University of your choice, so embrace it! CMB: What is your favorite trick or move to do on the field? IM: My favorite thing to do on the field is either 4 batons or a split leg pullout which is when I toss the baton in the air and catch it in a jump split when it comes down! IM: When twirling, I usually have great control with the baton and never throw it far off if I do drop it. But, one time at band camp, I almost knocked out a tuba player when I was tossing it and panicked while watching the baton. The tuba player had no idea, but I almost had a heart attack! IM: I will never forget a moment that touched me so much when the band traveled to UConn for a game with the football team! This little kid came up to me and said "I made a bet with my dad that if I gave you a kiss on the cheek, he would give me $100." That little boy got his $100 and I received such a good memory because his dad was very grateful at the end. He told me that he lacked self confidence to come up to people and I had helped in learn to have more confidence. CMB: Anything else you ant our fans to know? IM: Being the only twirler on the field can get lonely sometimes because everyone has their section except me! I love ho this band has made me feel so welcome, I am truly thankful for it. As a feature twirler, always try to be welcoming while getting to know everyone. There is no point in secluding yourself or thinking that you are a twirler and they are the band. Everyone is part of the same band and it is such an amazing experience to have! Temple Bands has shown me that!